Curated by Brittle Paper, written by Ayodele Olofintuade, with images to accompany the stories by Laolu Senbajo, starting today, February 19th, and for the next six weeks get ready to enter the wondrous and terrifying world of an Abiku. 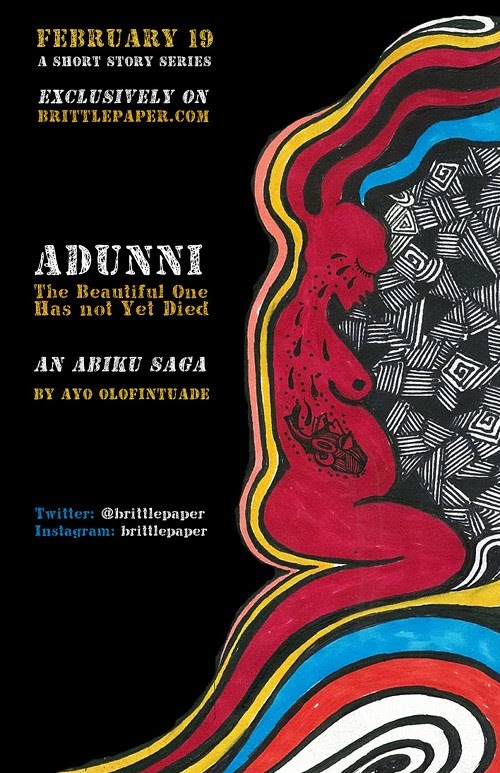 Titled, Adunni: The Beautiful One Has Not Yet Died, this project is an urban fantasy ensemble made up of eight stories and conceptual artwork. 'Abiku is the Yoruba word for a caste of spirit beings strangely bound to death. They are born to life as human children but die soon after their birth only to be reborn for yet another cycle of death and rebirth'. 'Is there a standard life cycle for all Abikus? No. Every Abiku tells Mother Earth how long it intends to stay and does everything it can to stick to that time frame. Some Abikus pledge to die a few says after they are born or months. Others might stay till right after their wedding night. They may choose to return to the same family several times until the mother's body dries out with age or decide to make their rounds with different mothers'. 'Adunni: The Beautiful One Has Not Yet Died is an eight-story ensemble built on the strange and terrifying world of an Abiku. For millenia, Adunni has had a good run as an abiku - no bereaved family or powerful Babalawo has tried to prevent her return to the spirit world. Ages of successful, glitch-free comings and goings have made her powerful, envied by fellow Abikus, loved by Mother Earth. But her luck runs out when she is born into the Lamorian family. Adunni: The Beautiful One Has Not Died is a gripping story of betrayal and lust for power. It is also a story of death and struggle to overcome death. Conniving and power-hungry gods are pitted against weak, selfish, and clueless humans. A pastor's fervor is set against a Babalawo's wisdom. A mother's undying love is tried by a child's terrifying power. Adunni's story is not, for all this, a mythological fable. It occupies that weird place where mythology tips over into urban fantasy. Adunni is set in present day Lagos and written by Ayodele Olofintuade, who knows so much about Yoruba cosmology that she can break the rules in unexpected ways'. The series sounds fascinating, but I'm also really loving the artwork by Laolu Senbajo. All that's left to say is check out Brittle Paper starting February 19th (and for the next six weeks) to follow the tale of Adunni, which by the way I have always thought is a beautiful name.